← First finds of 2012 – Morels are a month early! An up-close shot of one of the Shaggy Mane mushrooms I spotted right in my front yard. It’s been a terrible year for mushrooms. Other than the morels I found in April, I found squat. The drought really dialed back the growth I the woods I hunt. That said, I have seen some nice finds as I drove around this fall. A huge chicken of the woods sprouted in a front yard of a house about a half mile from my home. I also spotted a couple nice spreads of oyster mushrooms on trees in peoples’ yards. Meanwhile nothing ever grew in MY yard, and goodness knows I looked. Until two days ago, that is. A week of warm weather and copious rain caused the mushroom gods to smile upon my front yard. 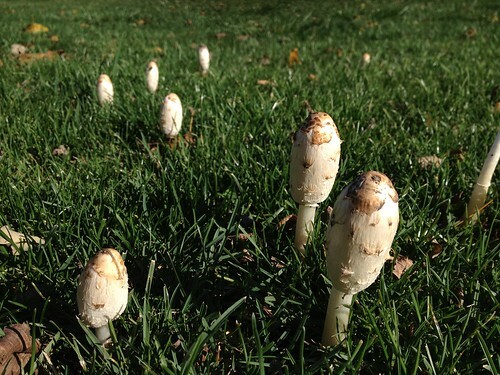 Shaggy manes in my front yard. A couple nights ago, as I pulled into my driveway, I spotted some strange looking shapes as my headlights swept over the yard. One look and I knew what they were – shaggy manes, one of the edible inky caps. The next day, after properly identifying them, I picked a cluster of the shaggy manes to make into an omelette for lunch. After brushing stray grass off the caps, I sliced them in half, checking each for the tell-tale super-fine gills and slid them into a saute pan with some melted butter. 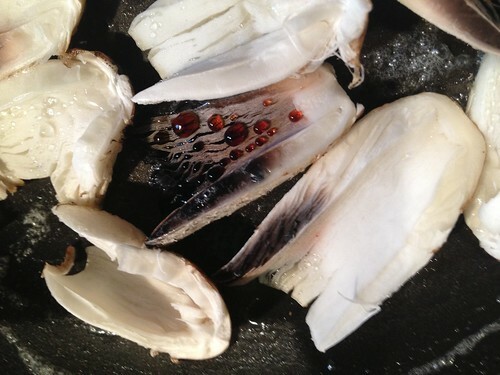 Shaggy manes are very delicate, and have a high water content. When they hit the heat, they actually start to expand and soften further. I kept the heat fairly low, cooking them gently. 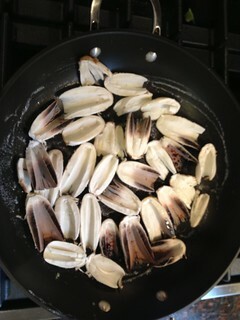 I also sprinkled a little bit of salt on them too, to encourage the mushrooms to release their water. They started to sweat, and the more mature specimens that were starting to show shading of their gills actually sweated red-tinged droplets. As the moisture leached, the mushrooms started to crisp, just a bit. At that point, I flipped them over, to cook both sides, and then poured a couple beaten eggs over them. 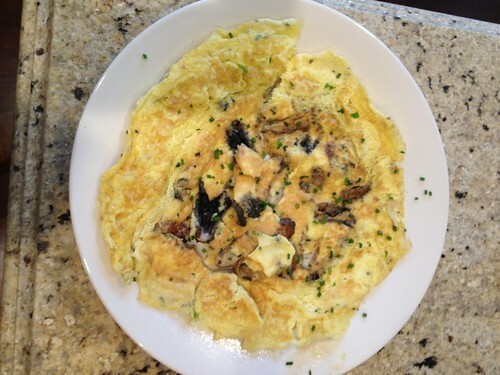 I think omelettes showcase mushroom flavors well, and the butter you saute the mushrooms in picks up their flavor, imparting it to the eggs. 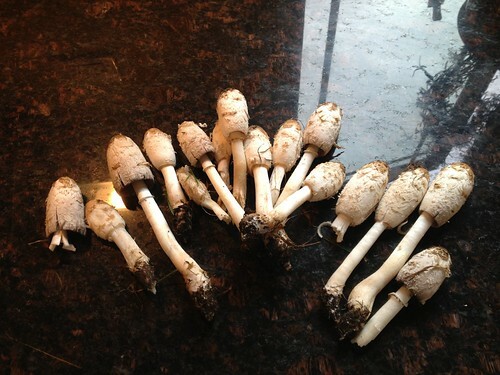 I had read that shaggy manes had a mild flavor. Three batches I’ve sauteed actually had lovely, pronounced mushroom flavor. The were delicious! This was a great way to end an otherwise disappointing season. 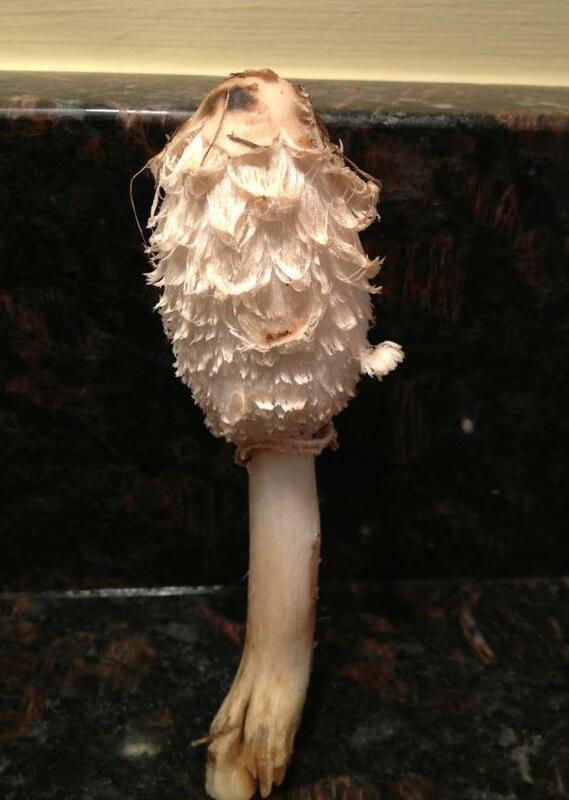 This entry was posted in edible wild mushrooms and tagged shaggy mane mushroom. Bookmark the permalink.